The Musée d'art contemporain de Montréal, created in the early 1960s, is part of the four largest Canadian artistic and cultural institutions. Originally housed in Place Ville-Marie, the Museum moved into the premises of the Château Dufresne in 1965, and then in the gallery of the Universal Exhibition at the Cité du Havre in 1968. Housed in its current premises in 1992 (designed by architects Jodoin, Lamarre and Pratte), the MACM is located in downtown Montreal, at the crossroads of streets Jeanne-Mance, St. Catherine, de Maisonneuve and St. Urbain. The MACM is one of three national museums, acting as a prime leader for other museum institutions in the province. It is the only Quebec national museum dedicated exclusively to contemporary art. The Museum's mission is to publicize, promote and preserve contemporary Quebec art in order to ensure a presence of international contemporary art through acquisitions, exhibitions and other activities. In order to fully meet the requirements of its mandate and mission, the Museum has come to the conclusion that it needs to redevelop and expand its spaces dedicated to public programming. 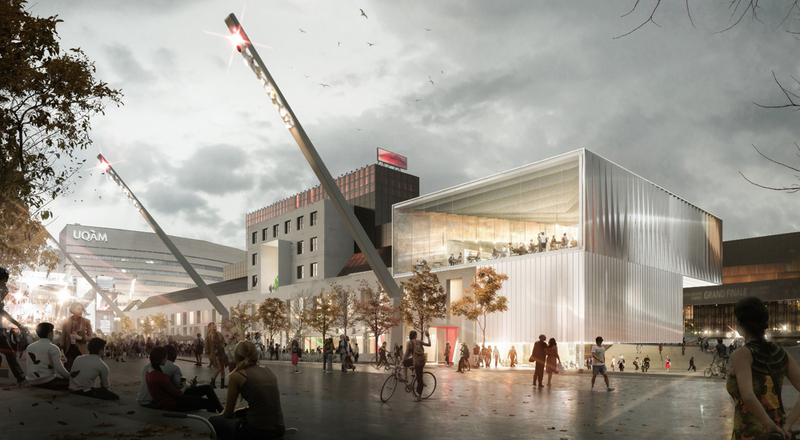 Since 2004, the Museum has been considering options to increase its visibility in the Quartier des spectacles while offering new programming to broadcast its unique and diversified collection. To respond to this program, the Société québécoise des infrastructures and the museum itself are looking to convert approximately 5,000 m2 and expand 1,500 m2 of its spaces. - Increase and improve spaces dedicated to education.